Freebie alert! Got a toilet paper roll that doesn't fit in the standard roll holder? Charmin has a solution for that with their Extender and you can get a Free one! 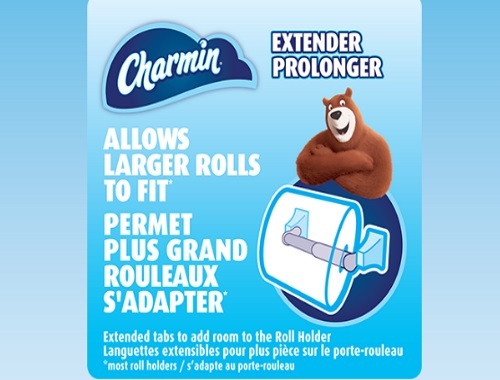 Fill out the form at the link below to request a Free Charmin Roll Extender. Limit 3 per household. Allow 2-3 weeks for delivery. Offer valid until June 30, 2018. Want to make sure you don't miss out on any Free Samples/coupon offers, please follow our private Facebook group here. Please note, this absolutely does work for Canadian addresses. If you are on a mobile I suggest switching to a desktop and trying it that way. If you must use a mobile, type in your postal code in one of the other fields on the form then copy and paste it into the postal code field (this will avoid the numbers issue that is coming up in the zip code/postal code field). Click here to request this freebie. Works on desktop or if you're on mobile, type your postal code somewhere else (notepad etc) and then paste it into the postal code field.